Click here for a free PDF of this lesson. The vocabulary is separated into nouns, verbs, adjectives and adverbs for the purpose of simplicity. A PDF file neatly presenting all of these words and example sentences in addition to common usages and specific notes can be found here. 어느 대학교를 다녀요? = Which university do you go to? 어느 대학교를 졸업했어요? = Which university did you graduate from? Notes: This is a combination of the adjective “검다” (black) and “색” (color). Put together, the word is a noun that means “the color black,” but is often placed before nouns to describe them (like an adjective) anyways. Therefore, you can often see this (and other words of color) used before a noun to describe it and also at the end of a sentence (attached to 이다). This is commonly used to refer to drinks like Coke, cider (which is similar to Sprite) and other carbonated beverages. 음료수를 주문할래요? = Shall we order some drinks? 중학교 또는 고등학교를 다녀요? = Do you go to middle school or high school? 내일 도서관에 갈까? = Shall we go to the library tomorrow? 오늘 밤에 뭐 할 거예요? = What are you doing tonight? 오늘 밤에 뭐 하고 싶어요? = What do you want to do tonight? This word appears in my Korean Sign Explanation Video 5. Notes: When two nouns are combined together to make one noun, and the first noun does not end in a consonant, the consonant ‘ㅅ’ is added purely for ease of pronunciation. Although “playing” is usually reserved for kids in English, adults in Korean will also say that they “play” with friends. This typically meets that they met and had a good time. Example: 제가 이것을 써도 돼요? = May I use this? 그 쿠폰을 VIPS에서도 쓸 수 있어요? = Can you use that coupon at VIPS too? 어떤 소설을 읽고 있어요? Which novel are you reading? Notes: 내다 can have many other meanings. See Lesson 14 for more information. 제가 보낸 돈을 받았어요? = Did you get the money that I sent? 가장 여행하고 싶은 나라는 뭐에요? What country do you want to travel to the most? This is used to indicate that you are sick (with a cold or something similar), and to indicate that a part of your body is sore. This is typically only used when somebody is actually old, not when somebody is comparatively older than somebody else. 그 나쁜 짓을 왜 했어요? = Why did you do that (bad action)? 바로 can be used to indicate that something happens immediately (in terms of time) or that something is “immediately” close to something (in terms of space. Notes: 즉시 can only be used to indicate that something happens immediately (in terms of time). It is less common than 바로. This word appears in my Korean Sign Explanation Video 4. 빨리 가자! = Let’s go quickly! 왜 너무 빨리 먹었어요? = Why did you eat so fast? 한국어를 얼마나 자주 공부해요? = How often do you study Korean? 여자 친구를 얼마나 자주 만나요? = How often do you meet your girlfriend? 돈을 얼마나 많이 가져갈 거예요? = How much money will you bring? 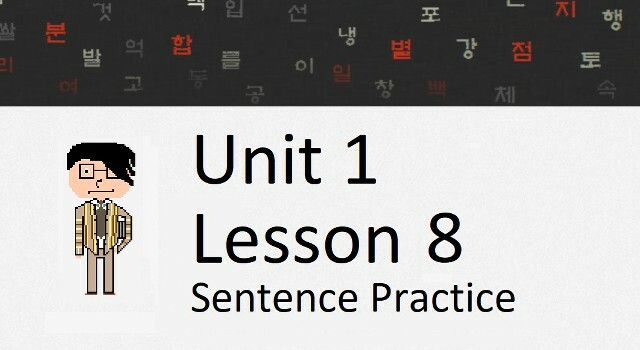 안 is placed before a verb or adjective to turn it into a negative word. The meaning is synonymous to ~지 않다. 방학 동안 집에 안 갔습니까? = You didn’t go home during vacation? There are 1050 vocabulary entries in Unit 1. All entries are linked to an audio file. You can download all of these files in one package here. To this point, you have studied Korean verbs and adjectives in great depth, but you have yet to learn much about Korean adverbs. First of all, what is an adverb? Adverbs are words in sentences that tell you when, where, or to what degree something is being done. 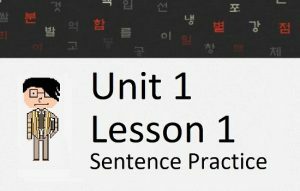 In this lesson, you will learn how to use adverbs in Korean sentences. Let’s get started! Anytime you put a word in a sentence that indicates when or where something is taking place, you must add the particle 에 to the end of that word. Keep in mind, however, that 에 is not the only particle that can go at the end of words of position or time. There are other particles that can go at the end of these words to indicate from when/where something occurred, until when/where, etc. For now, though, lets just talk about 에. In the first sentence, “hospital” is the thing that you are building – so it is an object, which requires you to use the 을/를 particle. In the second sentence, the hospital is the place in which you went to – so it is a place, which requires it to have the 에 particle. 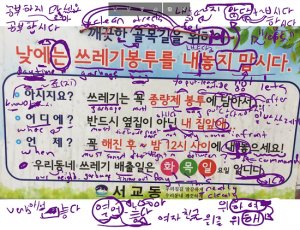 저는 내일 한국어를 공부하겠어요 = I will study Korean tomorrow. 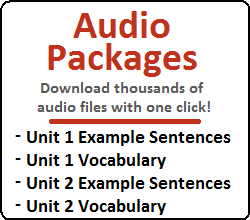 When adding these types of adverbs to sentences, no particle needs to be attached. 저는 밥을 많이 먹었어요 = I ate a lot of rice. Their respective meanings are identical. It is up to the speaker to decide which one will be used. There are times when it will be more natural to use “안” and there will be times when it will be more natural to use “~지 않다.” At this point, you can consider them the same. Throughout your studies you will constantly be exposed to 안 and ~지 않다, and through this exposure you can gradually develop a preference for which one should be used and in which circumstance. I like to share my observations that I have made through my experiences with the Korean language. I think this can be helpful to learners as they struggle to understand when to use some grammatical principles over others. There are a few things I would like to talk about regarding these negative sentences. Below are some examples, with possible conjugations of 아니다. You have learned how to conjugate verbs and adjectives, but you still haven’t learned how to conjugate 이다 and 아니다. You will learn this in the next lesson. 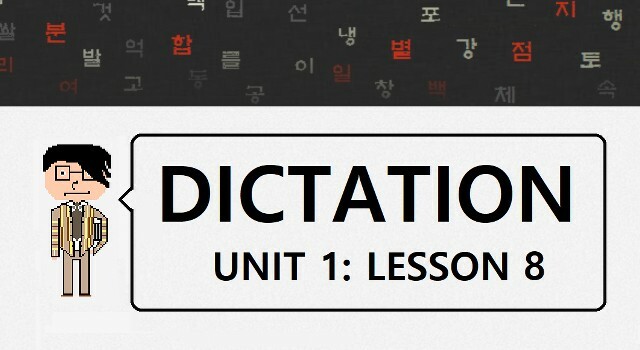 Notice that because 싫다 is an adjective, it cannot act on an object, so the particles ~이/가 are attached to the noun. This type of sentence is a little bit too complex right now, so I don’t want to dig too deep into it. I discuss this more deeply in Lesson 15. 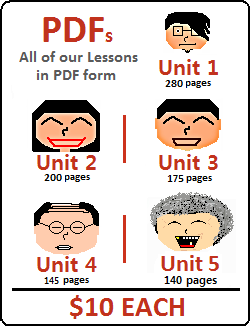 There are 1250 example sentences in Unit 1. All entries are linked to an audio file. You can download all of these files in one package here. That’s it for this lesson! I don’t think this one was very hard. I went easy on you! How about testing your knowledge on what you learned in the past 8 lessons with our Lessons 1 – 8 Mini-Test. Then let me browse through the next set of lessons (Lessons 9 – 16)!